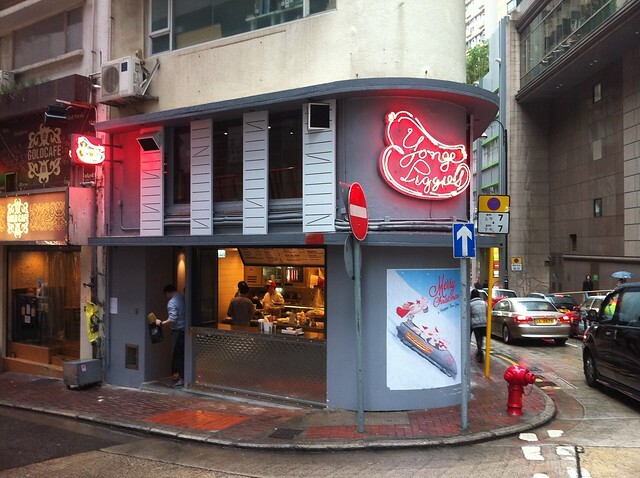 So I was at Sheung Wan one Saturday afternoon after a somewhat grueling workout, hungry for sustenance. It occurred to me that I had yet to check out Yonge Piggies (pronounced as “Young” Piggies) which is right across the street from the gym. Geographically speaking it couldn’t be any better; imagine hordes of starving gym bunnies descent upon Yonge Piggies all looking for their calorie fix. That gives a whole new meaning to “why did the bunny cross the road?, doesn’t it? Anyway, so in total disregard to the workout I just did (I am using that term very loosely here), this non-bunny crossed the street for lunch. It was a rainy day, so there outside stools were removed, and I had to sit inside. Not that I am complaining; I do think Yonge Piggies is the perfect spot for some people watching while you digest some Canadian street food.